The Child comes home a few days before Christmas, and we settle into a quiet routine. Throughout January, I ask about homework she needs to do or assignments she needs to make up after her lengthy school absence, and I am offered assurances that feel hollow: I’m all caught up! Everything is done. Eventually, the teachers start entering grades, and she cannot hide from the truth, reported online. She is overwhelmed. She is lost. On a Friday evening, I begin emailing other schools, asking if they will accept a transfer, and discover there are new schools in the area that are looking for students. I give her the options, and an offer to help her organize her work, and for the first time since she started elementary school, she accepts my offer. She writes a list of things that are due, and I tell her to do the shortest ones. She does several, and I push her a bit. Do the other ones, and I’ll take you to McDonalds when they’re done. When we pass through the drive-thru, she seems as pleased with her McNuggets as with her work. I wake her early the next morning, and her worried look has returned, in spite of the incentive I offer: bacon and eggs for breakfast. She’s remembered more assignments, added them to her list, which is now longer than the night before. I notice that all the assignments are still there, and ask, why didn’t you cross off the ones you did? I put x’s next to the ones that are turned in. Do me a favor, I ask. Could you draw lines through the ones you’ve done? It’s hard for me to tell otherwise. She draws lines through the ones she’s finished, and the list looks manageable once again. She brightens: maybe I should do it that way, then I can see how much I really have left. She dives in to her work, sitting on the sofa, laptop on her knees. I try to supervise, but not hover, so I make myself busy in the kitchen, checking in periodically to make sure her breaks don’t extend into hours, or to offer food and encouragement. I make batches of marmalade, with varying results: Some too sweet and runny, another too bitter, but nicely firm. The runny batch was the first attempt: it was pleasantly sweet, but slid off my morning toast and covered my fingers with sticky mess. I looked for ideas to fix the problem, but then, recognizing a losing battle, give up and simply look for recipes that use marmalade. Somewhere in my pinterest pins, I found this simple recipe for yogurt cake with a marmalade glaze, which makes the jam’s pourable quality into a virtue. As an added incentive, the recipe involves only ingredients I happen to have handy. I ended up making this cake twice: The first time with the grated zest of half an orange, and the second time, with the grated zest of a small lemon. Even though the original recipe calls for lemon, and numerous other recipes for similar cakes call for lemon, The Child and I both preferred the first version with the orange, which allowed more of the almond flavor to shine through. That said, both cakes were consumed in the same amount of time. In the end, we liked the cake so much that it was half gone before I remembered I had meant to glaze it, so I never got around to it. Certainly, some marmalade glaze would be nice on it, as would some fresh berries and whipped cream, or almost anything, really. Or, just set it on a plate next to your laptop, and nibble on it while you do your homework. Preheat the oven to 350 degrees. Butter an 8½-x-4½-inch loaf pan and set aside. Whisk together the flour, ground almonds, baking powder and salt in a medium bowl, and set aside. Put the sugar and zest in another bowl and work the zest into the sugar with your fingertips. The sugar with become moist and aromatic. Put the sugar into the work bowl of a standing mixer fitted with the whisk attachment, and at a medium speed, whisk the yogurt, eggs, and vanilla into the sugar until thoroughly incorporated. Continue whisking and add the flour mixture, then turn off the mixer and fold in the oil using a spatula or wooden spoon. Scrape the batter into the pan and smooth the top. Bake 50 to 55 minutes, or until the cake begins to come away from the sides of the pan and a toothpick comes out clean. Let the cake cool in the pan on a rack for about five minutes, then use a knife to loosen the cake and remove it from the pan to cool completely. Thanksgiving is tomorrow, and though the details may vary from house to house, the meal and ritual involved are largely the same from place to place, and certainly within each home, from year to year. With the exception of a few non-critical side dishes, my Thanksgiving menu has not varied since the first year I made it. I had experimented with the annual Thanksgiving issue of Gourmet each year, before finally settling on one issue I particularly liked, which contained a recipe for Cornbread and Spiced Pecan Stuffing that is, to me, The Thing I Look Forward To every year. That first year I made it, I served it to a boyfriend I have long since lost track of, and an assortment of coworkers I’ve also mostly lost track of. One of the side dishes I made that year was cranberries with Wild Turkey, which was a big hit with the twentysomething crowd; my cranberries have long since been Disnified for the below-21 crowd. I miss the Wild Turkey. I’ve served the meal in an assortment of places through the years: my house in Connecticut, with The Foreigner, who thought it was “too much food”; the crappy little apartment I lived in with The Child after he left, where I shared the meal with another newly-divorced woman I’d only just met. That year, her eight-year-old-son beat my high score at Railroad Tycoon on my computer while mom and I traded divorce war stories over pumpkin pie in my cramped living room. In recent years, the changes have been less pronounced, and Thanksgiving fell into a nice annual routine. Every year, I made the Turkey and stuffing at my house, and my friend Anne and whoever else was around came over with side dishes and desserts. For Christmas, we moved the festivities to Anne’s house, where she made a ham, and myself, The Child, The Departed, and whoever else was around would show up with an assortment of side dishes and board games. Every year on Thanksgiving, I say I’ll serve the meal at 2pm; Anne is always late and the turkey either takes much longer or much less time than I expected. I try to have some food on hand for people to nibble on while they’re waiting for either the turkey or Anne or, many years, both. Ideally, I try to serve something that won’t be too filling or guilt-inducing. Neither Anne nor The Child eat meat, so I need everyone else to help out and consume that bird with me. This year’s offering is from my new favorite cookbook, the The Cook’s Illustrated Cookbook , aka, my lucky cookbook. I am still trying to use up a supply of dried organic chickpeas my father brought on one of his visits (like, a year ago? ), and I was excited to find this recipe, which is also helping me work down my supply of artichoke hearts (in case of the apocalypse, if you need artichoke hearts, let me know – I stocked up at Costco for reasons that remain mysterious even to me). 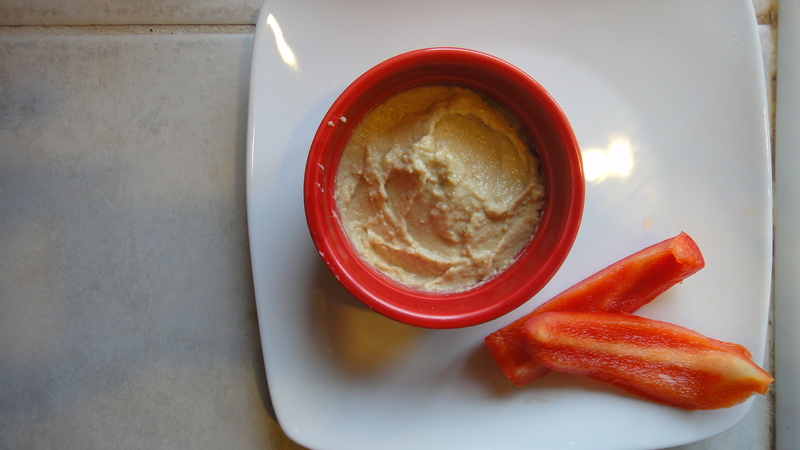 Apart from helping me resolve my over-stocked pantry issues, this recipe is delightfully simple, and the hummus it makes is light and lemony – super with some crisp sliced veggies. Combine water and lemon juice in small bowl. Whisk together tahini and olive oil in second small bowl. Process chickpeas, artichoke hearts, lemon zest, garlic, salt, and cayenne in food processor until almost fully ground. Scrape down bowl with spatula. With machine running, add lemon-water mixture in steady stream; continue to process about a minute. Then add tahini-olive oil mixture in steady stream. Process until hummus is smooth and creamy, about 15 seconds, scraping down bowl as needed. Serve with sliced vegetables. Drizzle with olive oil if you like; garnish with sliced artichoke hearts if it makes you happy.